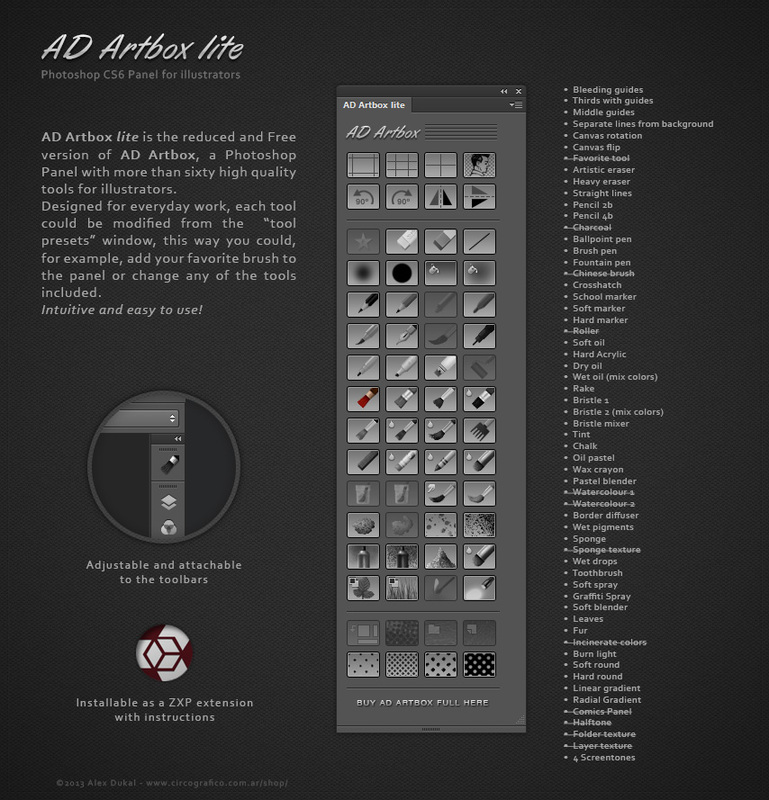 AD Artbox lite is the reduced and Free version of AD Artbox, a Photoshop CS6 Panel with more than sixty high quality tools for illustrators. Designed for everyday work, each tool could be modified from the “tool presets” window, this way you could, for example, add your favorite brush to the panel or change any of the tools included. Intuitive and easy to use! 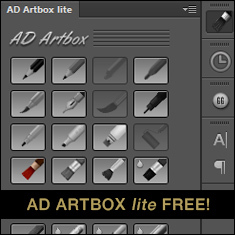 I highly recommend to TRY the AD Artbox lite before purchase the AD Artbox full version. I installed the lite version in Creative Cloud. Also loaded the the panel into the stage. But unfortunately none of the brushes are working. Any idea? as you probably know Creative Cloud means -in some way- CS7 and this panel is just for Photoshop CS6, so don’t expect to use it in CC without troubles. I’m sorry. There’s a CC version upcoming but I’m not having too much time actually, maybe somewhere during august (I hope). Tengo photoshop CS6 y por algún motivo cada vez que quiero ocupar los pinceles me sale una advertencia “The command “Select” is not currently available”. Que estada pasando? hace un mes lo podía ocupar. Lo que debes hacer es abrir la ventana Tool Presets (Window > Tool Presets) y desmarcar la opción “Current tool only”.